A banana craze + a mad love for cakes made in a pan = banana pancake variations for every season. In addition to my simple banana pancake and my cranberry banana pancake posts, I'm adding blueberry pancakes because, I mean, I might as well be listed as a blogger specializing in banana pancakes. Allow me to remove my new headline of alittlebaker to become the one and only bananapancaker. Man, why didn't I think of that one a few weeks ago.. It's actually rather odd that I made pancakes for just myself, as I normally only spend time on breakfast when I'm spending my morning eating across from someone I love. In other words, I must really miss Luis and the occasional weekend mornings that we would both happen to be off of work. Those mornings don't come too often, but when they do - we make pancakes. It's been two odd months with mornings that are absent of both bad breath kissing and poor aimed pancake flipping. Two bittersweet activities I adore on Saturday Mornings. But today, it is Tuesday afternoon and I am still in my pajamas eating these pancakes aside my computer, whilst writing to you. The timing may be incorrect, but I think I've decided at 4:22pm that it is probably a good idea to begin my day. But first - I must savor this final bite.. In a measuring cup, stir together almond milk and vinegar. Let rest for 5 minutes to create "buttermilk." In a large bowl, combine flour, sugar, baking powder, baking soda, cinnamon, nutmeg, and salt. Combine buttermilk with mashed banana and vanilla extract. Then, fold the wet ingredients into the flour mixture only until combined. Lightly fold in blueberries to incorporate. Prepare a skillet by greasing with coconut or olive oil and setting over medium heat. Use a ladle to drop pancake batter onto the hot skillet. Cook, flip, repeat, eat. 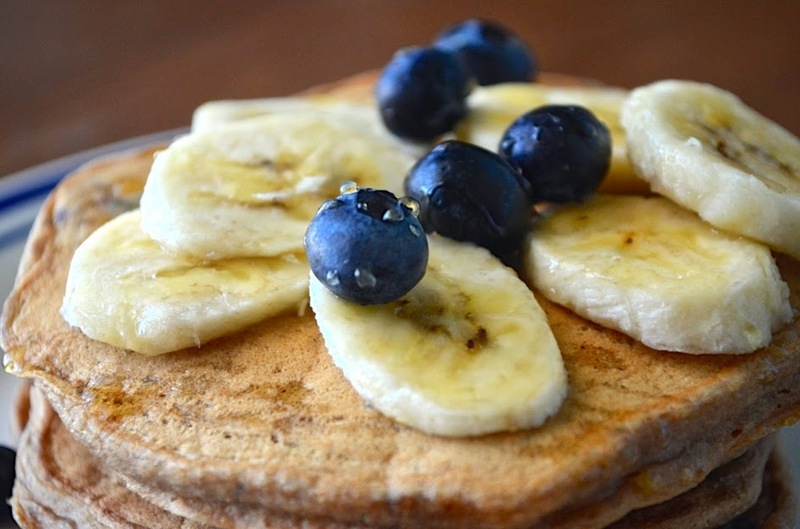 I'm pretty sure I'd be making these banana pancakes even if I wasn't vegan! Sometimes things are actually better when they're vegan, like vegan shampoo.